Possibly the most earnest folks in the real estate development industry assembled for the 20th anniversary of the founding of the Congress of the New Urbanism in West Palm Beach, Florida this month. Among the excellent accomplishments of CNU20 attendees: a credible car/pedestrian strategy, some fine looking new communities, and perhaps best of all, a body of hard-won knowledge about town-making for citizen education. Officially, CNU20 was optimistic and confident, but an undercurrent of negativism marred the event. More than one New Urbanist questioned the validity of what by now should have been a transformative movement. But the imposition of form-based codes and regulations on city growth has become a stress point in the movement's evolution. Three hundred communities now boast New Urbanist town planning, over a dozen communities have adopted form-based zoning, and urban design schools are teaching the New Urban principles all over the country, facts triumphed during the opening plenary session. Form-based zoning uses a hierarchy of increasingly dense districts with defined boundaries, rather than land-use (or Euclidian) zoning to regulate growth. These principles are exquisitely defined in a model code nicknamed the Smart Code, which defines street width and sidewalk width, and provides fine-grained guidance on the form of a building on a given lot. Participants in early work sessions were taught how to work the code, and walked the hot, humid streets of West Palm Beach to interpret its many nuances and subtleties. In 2003, Downtown West Palm Beach was redeveloped, and it should be a proud example of the earliest New Urban efforts. Instead, conference participants spoke of the result with open distaste. The main outdoor plaza features a noisy fountain, which a group of attorneys, architects, and land planners belittled as "a mini Bellagio”; a pale imitation of the huge Las Vegas hotel's water feature. Andrés Duany, one of the founders of the CNU, stated during the conference that “much of the architecture of the downtown zone was junk.” The movement’s most flamboyant spokesman, James Howard Kunstler, cited the "cartoonish, low quality finish of the buildings” as a failure. The distance New Urbanists have put between themselves and one of their finest achievements is dismaying. When not complaining about West Palm Beach, many practitioners wandered the somewhat sparse exhibit hall of booths sponsored by municipalities, attorneys, and consultants. Conversations often hit notes of personal suffering. Few new communities of any scale are being funded, so just as the supply of highly trained New Urbanists has hit the market, demand has dwindled to a trickle of infill projects here and there. Morale at the ground level was quite low, given the effort New Urbanists have put forth. Pedestrian-based urban form is a science that New Urbanists can offer to every community, and it has been a win for them where it has been implemented. Our monocultural vehicular transport model of car-dominated cities has made people work hard to carve out social space. The New Urbanist critique of the aesthetics of transportation is right on target. Armed with plenty of real data about how pedestrian environments work, New Urbanists have succeeded at softening the city and allowing pedestrians to compete. New Urbanists can also point to successes in the real estate market. In one study session, three single-family residential New Urbanist communities were analyzed, and the developer’s financial models were revealed. Each of the three communities fared better than their competitive set through the 2008-2012 cycle, in terms of net present value, appraisals, and foreclosure rate. New Urbanists claimed credit for this, although the affluent demographics and in-town locations tilted the plate in their favor. Still, New Urbanists have created a strong model that works for a segment of the population. Perhaps New Urbanism's most potent contributions are to the art and science of traditional town planning. A solid body of knowledge that is based upon beautiful real places— Charleston, South Carolina and Savannah, Georgia, to name just two — now informs much of the theory behind place-making. We Americans are notably unsentimental about our cities, tearing down landmarks and whole districts in the quest for efficiency and betterment. New Urbanists have made it fashionable once again to care about history and good design, and our cities are the better for it. The CNU’s 20th anniversary marks a curious point in the life of this laudable and lasting movement. Because there isn't any new development occurring, government effortshave turned towards adding form-based code overlays to existing cities. Already, Miami and Philadelphia have passed these codes to regulate growth. Many other cities like Orlando operate a standard zoning code by ordinance, while enforcing a form-based code as well. Property owners, developers, and design teams must now satisfy the intricacies of two local codes, rather than one, to get a building permit. While de-regulation is a term on everyone’s lips, this quiet up-tick in regulation has occurred largely under the radar screen. Those pushing for form-based code are largely consultants, who argue that the code will make for a better city by protecting us from ourselves. Municipal officials are amenable to, it, too.Both groups see the job security it promises them. Developers see profit if their communities can boast adherence to a strict code that promises a better lifestyle. Developers would normally scream loudly at any new regulation, no matter how trivial, but they are passively allowing form-based code because of the effect it can have on their bottom lines. If these codes tend to increase cost, well, the financial investors don’t complain, because the more money that's borrowed to complete these structures, the more interest income they earn. So — form-based codes benefit all the interest groups that advocate their implementation. At CNU20 we witnessed the coming of age of a new regulatory regime. Place-making, once an activity trusted to individual citizens, has become codified; a vision enforced by authorities and interpreted by high priests who have special training to understand how to make a proper city. Maybe we have so abused our power as individuals that we deserve to have this power taken away. Perhaps our city form is so ugly, and so dysfunctional, that we cannot rescue it without serious intervention. Or, perhaps not. The American Dream is not about freedom from sprawl, as suggested in the movement’s seminal manifesto, “Suburban Nation”. Rather, it's about freedom to choose. New Urbanists might be able to provide this freedom within the confines of a new institution, the Smart Code, as long as the Smart Code produced good results. But if the critique at CNU20 of their own Downtown West Palm Beach is any indication, the Smart Code ain’t so smart after all. American town planning needs less regulation, not more. Let’s use CNU’s body of knowledge to educate citizens and provide a path forward, not with the manacles of a new code, but with the freedom to create a new urban form that suits the lifestyles of the 21st century. Flickr photo by Eric Alix Rogers, New Urban, in Six Corners, Chicago. 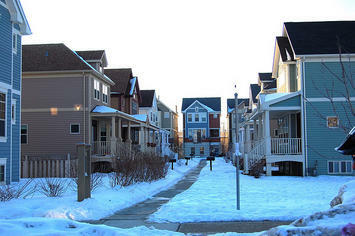 New houses, all facing a common sidewalk, with garages on alleys behind. Off of Kilbourn, just south of Irving Park. Richard Reep is an architect and artist who lives in Winter Park, Florida. His practice has centered around hospitality-driven mixed use, and he has contributed in various capacities to urban mixed-use projects, both nationally and internationally, for the last 25 years. Submitted by taiyoutube on Tue, 06/17/2014 - 03:19.